Spring—it’s about time! I had a race with January and February to complete my fifth novel, “The Innocent Hour,” which will be released by Black Opal Books on Saturday, October 19, 2019. What better way to invest bitter cold days than by the fire conniving on my Mac. I’ve managed to confuse people who like to read a series in order. “The Innocent Hour” will be the sequel to my debut novel, “The Dying Hour.” In between these two mysteries is the Trust Series: “A Matter of Trust,” “Redeeming Trust,” and “Vanished.” If you haven’t read “The Dying Hour” yet, you might want to meet the characters before their new adventure launches this fall. Spring for me means digging up dirt—in my shade gardens, that is—while plotting murder and mayhem. From my third-story office window, I’m watching Mrs. Bluebird build a nest in her box, and a blue jay chasing a hawk, silly bird. A swath of snowdrops is blooming riotously even as the last snow melts. 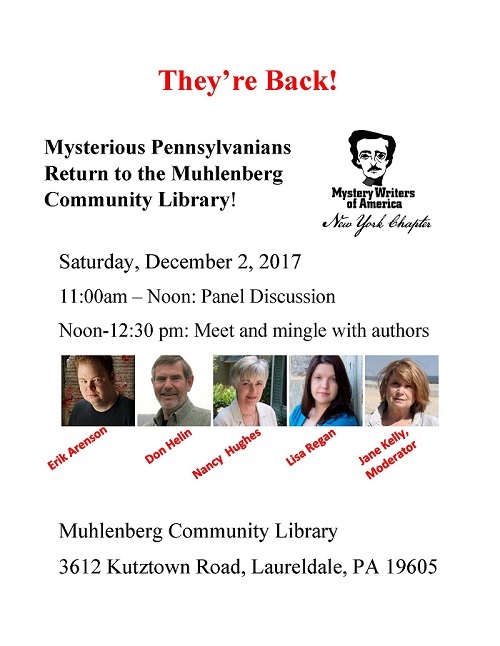 I’ll give my Mac a rest while meeting readers here in PA, in NY, and NJ and participating in author events throughout the year. I hope you'll stop by--I'd love to see you. Have a glorious Spring! And do drop me a note under "Contact." p.s. Books make great birthday, Mothers/ Fathers Day, graduation and hostess gifts. Happy reading! Redeeming Trust, the sequel to A Matter of Trust, was in the news! Click here to read the full article that appeared in the Sunday, December 17, 2017 newspaper facing the best-seller list. I’ll be participating and/or attending the following events. I would love to see you there. Saturday, April 27, 2019, 9:30 a.m.
Saturday, November 2, 2019, 11 to 4 p.m.
Monday, December 3, 6 p.m.
Saturday, December 8, 2018, from 10 to 12 noon. Friday, November 9, at 6:30 p.m. 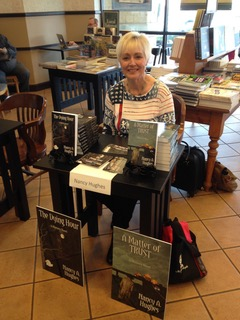 The Mysterious Bookshop hosted a book signing for Nancy’s new mystery novel, the third in the Trust trilogy. The oldest mystery bookshop in the country is located at 58 Warren Street, NYC, in Tribeca, and shelves works of 1300 mystery writers and 541 Sherlock Holmes items. Nancy was interviewed on Good Day PA ABC 27’s “Author Spotlight” on Tuesday, October 30, to talk about her newest novel, “Vanished: A Trust Mystery.” The third mystery in the Trust series will be launched October 27. Good Day PA’s lifestyle TV program airs at 10:30 each weekday afternoon. Click here to view the program on the ABC27 website. 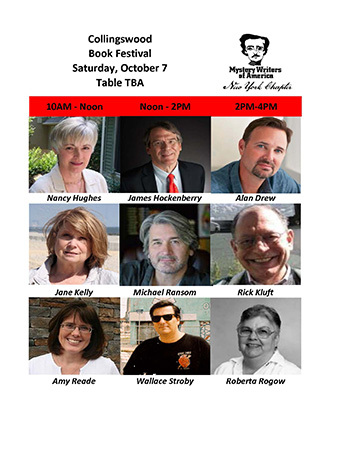 Saturday and Sunday, October 27 and 28, 2018, from 1 to 4 p.m.
Click here to to read the post on The Write Way Café. 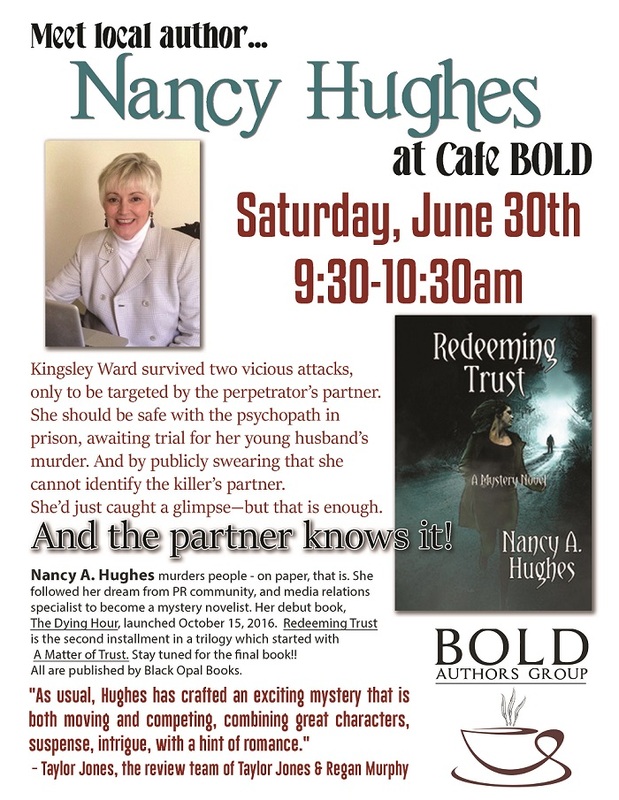 Saturday, November 3, 2018, 11 to 4 p.m.
On Thursday, November 1, Jungle Red Writers hosted Nancy as their blog guest, which coincided with the release of Vanished: A Trust Mystery. Her topics include what inspires her writing, particularly her shade garden. Click to read the entire post. 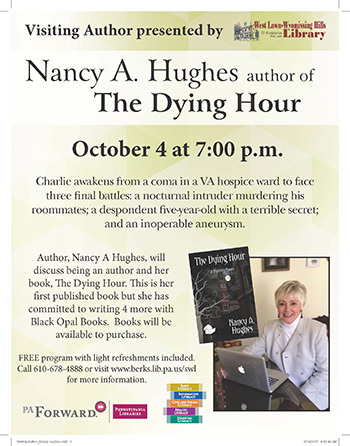 Tuesday, September 18, 2018, 6 p.m.
Wednesday, September 12, 2018, 6:00 p.m. - 9:00 p.m.
Nancy and co-MWA author Don Helin book signing at the Camp Hill Barnes & Noble at 1 p.m. He will discuss life in the NYPD during the era of minority arrest quotas. You don’t have to be a member of MWA to register for this amazing symposium. Pre-Edgars party. Stop by to meet this year’s Edgar nominees and your favorite authors. 6:30 p.m. launch party. Come meet my friend Phyllis if you possibly can! Saturday, November 18, and Sunday, November 19, from 1 to 3 p.m.
on Saturday, November 4. 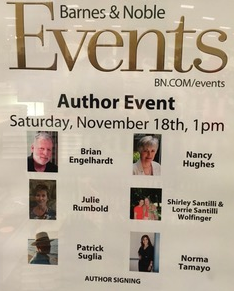 I’ll be greeting book lovers between 2 and 4 p.m. at their Local Author Event. 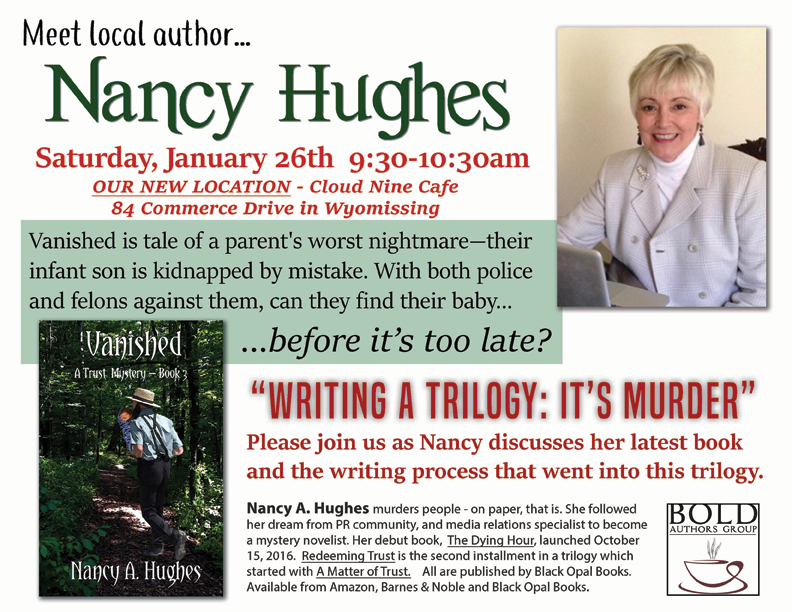 The Lancaster B & N is located at 1700 Red Rose Commons, Lancaster Pa. 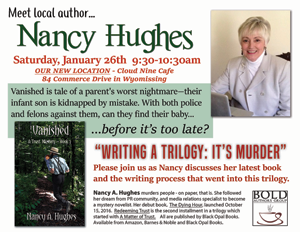 When: Saturday, October 7, 2017 • 10 to 4 p.m.
Why: Welcome readers to hear Nancy Hughes odyssey from journalist to a life of crime—fiction, that is. Who would have thought? Spring, the most beautiful time for my shade garden, a washout. Rather than writing in my restful summer office built by my hero-husband from 100-year-old barn boards, I was stuck inside, watching invigorated weeds choke my perennials. But hat better time to write as deadlines loomed and summer relinquishes its grasp! This summer, Vanished: A Trust Mystery, Book 3, is in the capable hands of my Black Opal Books editor. Their talented artist has designed a beautiful cover. I’m busting to share, but the release date isn’t until October 27. So far away! But the day will arrive, along with our raking the explosion of leaves this rain encouraged. In the works: I’m hoping to launch Vanished in NYC, as I did with The Dying Hour. Details will follow. 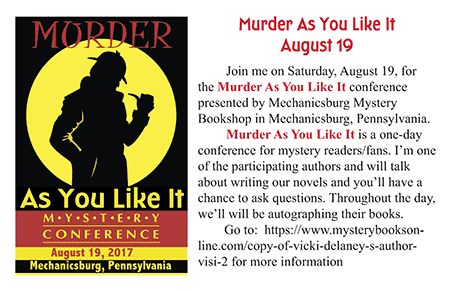 And I’ll be participating in author events in late summer and fall. I’ll keep you posted here and on social media. I hope you’ll stop by—I’d love to see you. All the best!